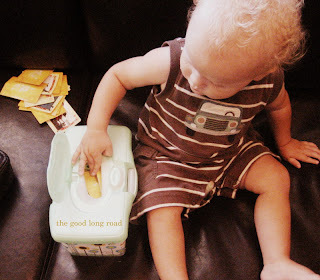 Simple Ideas for Baby Play at Home (#4) + Weekly Kids Co-Op: Link-Up & Play! 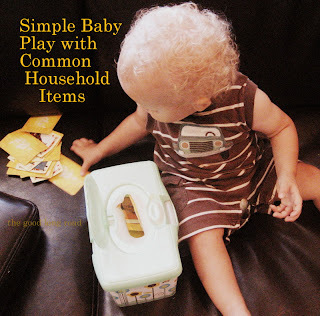 It is the third Friday, which means it is time for another post with simple baby play ideas using items you already have at home. 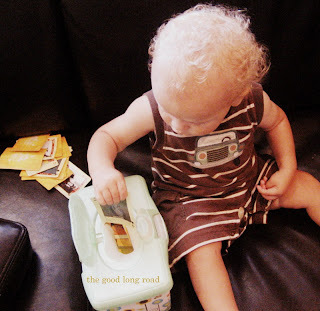 I first did a baby play post like this in August, when I realized that I write a ton about Wild Thing, and Caterpillar deserved some blog love too! So, here is Caterpillar with some of his favorite baby play activities. We rarely have wipe containers, since we usually buy them in bulk, but I will say an empty wipe container is a great baby toy. Caterpillar acquired his obsession for putting things in and taking things out of wipe containers at probably 6 months old. Once baby can sit up on their own, activities like this are great encouraging motor skills and hand-eye coordination. Playing cards and matchbox cards rank as favored items for the wipes box. Last month, we shared Frugal Fun 4 Boys with fabric wipes in the wipes container, and Close Families shared a comment that colorful scarves provide lots of fun in a wipes container too. I love child-led or child-discovery play activities. I gave Caterpillar some cups and he found a bottle from the recycle bin and the creativity (and learning) began. 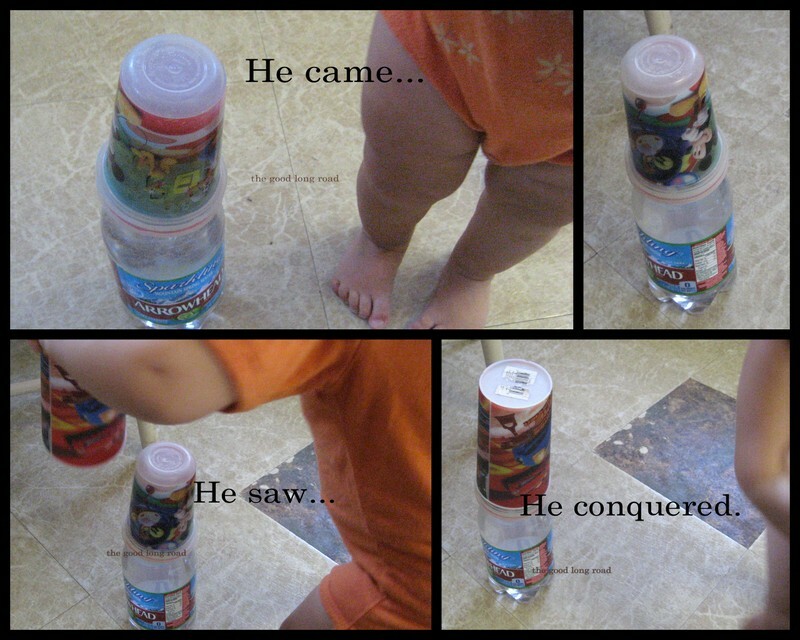 He created his own stacking toy. This kept him occupied for quite some time. He started doing this at about 9 months, but stacking toys are popular with babies even before 9 months and you can certainly create your own. Stacking toys also help with motor skills and hand-eye coordination, as well as with problem solving. 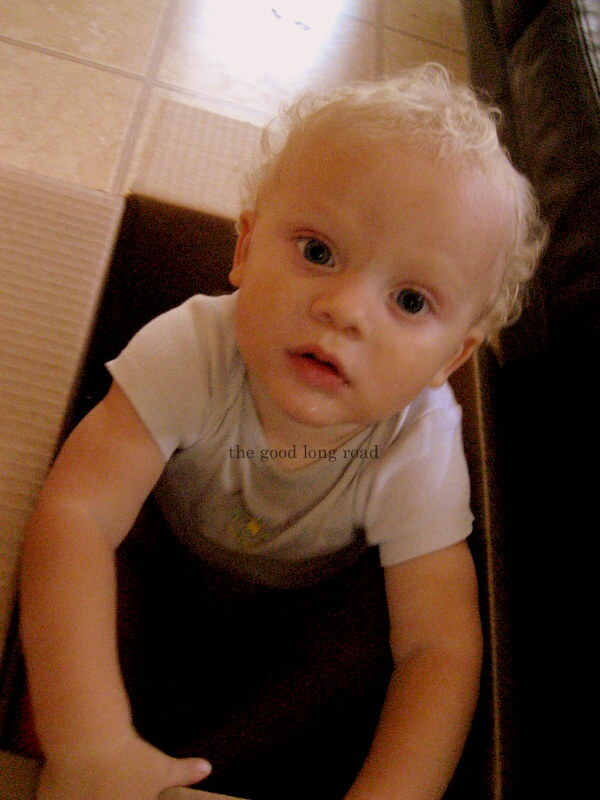 Babies love empty boxes too! This holiday season, expect the boxes from Christmas gifts to rank almost as high as the gadget or toy (maybe higher for some kids). Heck, just go ahead and wrap an empty box! :) Caterpillar and Wild Thing both have so much fun with boxes and their box love started early (probably at 6 months for both). Toys that do things themselves (light up, talk, move, etc.) leave the child without much to do, hence the reason that I think cardboard boxes are so popular -- the child or baby gets to do all the work and their box becomes limited only by their imaginations (and even babies have big imaginations). 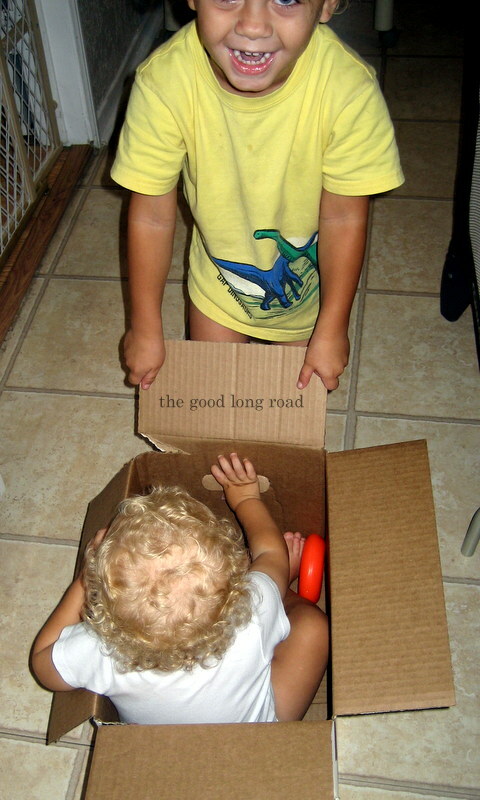 What has your child or baby done with a cardboard box lately? Since today I am also linking up and sharing the Weekly Kids Co-Op, I selected two baby-related posts from last week to highlight. From Raise A Boy, a baby photo session mishap. You must click through. You will, possibly, fall out of your chair laughing and it will be worth it. 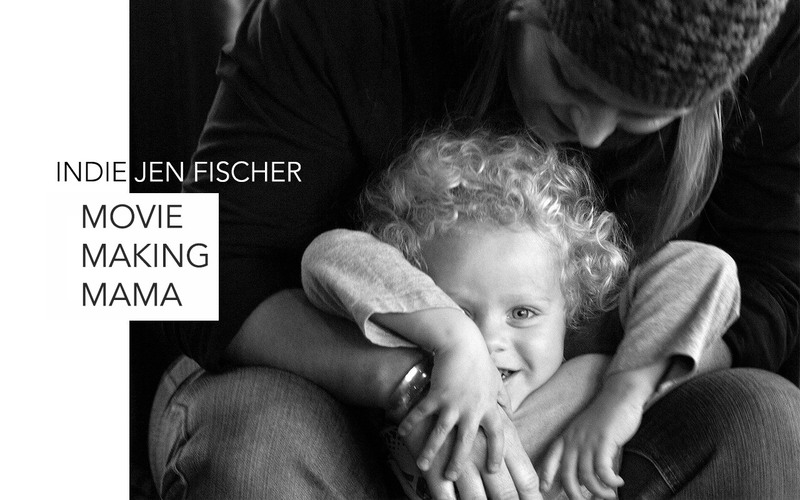 If you have ever tried to recreate some magical photo experience with your baby and toddler and had it end up as a total fail, you will appreciate her post even more. Now for a post from the Co-Op that is at the opposite end of the baby spectrum. I am balancing the funny with the serious and sharing this heartfelt post about Post-Natal Depression from Mummyology. Check out my other baby play posts: Simple Baby Play Ideas at Home (#1), Simple Baby Play Ideas (#2) - Upcycle, and Simple Baby Play (#3) - Sharing Ideas from other Mamas. 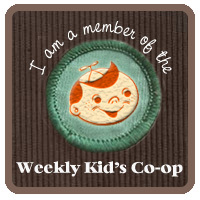 Now, it is your turn to share or to just enjoy browsing all of the other great activities linked up through the Kids Co-Op this week.